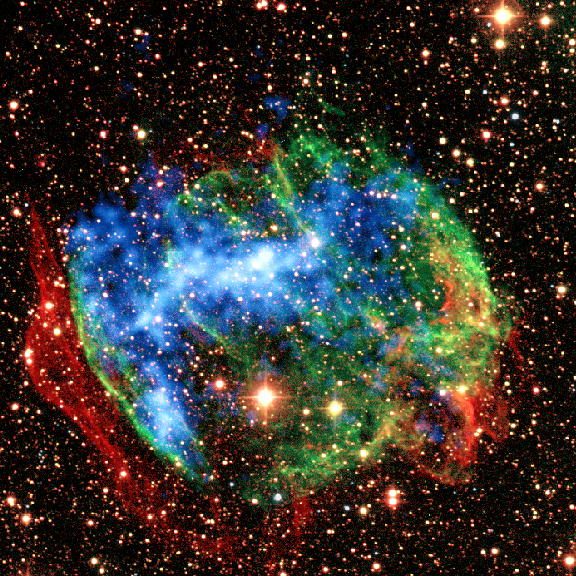 A composite Chandra X-ray (blue) and Palomar infrared (red and green) image of the supernova remnant W49B reveals a barrel-shaped nebula consisting of bright infrared rings around a glowing bar of intense X-radiation along the axis.The X-rays in the bar are produced by 15 million degree Celsius gas that is rich in iron and nickel ions. At the ends of the barrel, the X-ray emission flares out to make a hot cap. 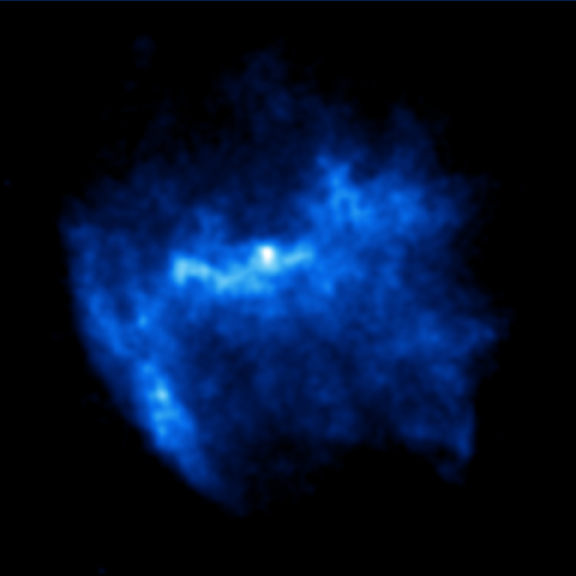 The X-ray cap is surrounded by a flattened cloud of hydrogen molecules detected in the infrared. These features indicate that jets of hot gas produced in the supernova have encountered a large, dense cloud of gas and dust. The following sequence of events has been suggested to account for the X-ray and infrared data: A massive star formed from a dense cloud of dust and gas, shone brightly for a few million years while spinning off rings of gas and pushing them away to form a nearly empty cavity around the star. The star then exhausted its nuclear fuel and its core collapsed to form a black hole. Much of the gas around the black hole was pulled into it, but some, including material rich in iron and nickel was flung away in oppositely directed jets of gas traveling near the speed of light. When the jet hit the dense cloud surrounding the star, it flared out and drove a shock wave into the cloud. An observer aligned with one these jets would have seen a gamma-ray burst, a blinding flash in which the concentrated power equals that of ten quadrillion Suns for a minute or so. The view perpendicular to the jets would be a less astonishing, although nonetheless spectacular supernova explosion. For W49B, the jet is tilted out of the plane of the sky by about 20 degrees, but the remains of the jet are visible as a hot X-ray emitting bar of gas. W49B is about 35 thousand light years away, whereas the nearest known gamma-ray burst to Earth is several million light years away — most are billions of light years distant. If confirmed, the discovery of a relatively nearby remnant of a gamma-ray burst would give scientists an excellent opportunity to study the aftermath of one of nature's most violent explosions. Scale Image is 5.7 arcmin across. Coordinates (J2000) RA 19h 11m 07s | Dec +09° 06´ 00.00"